Opis: Late last month a team of Mars-watching astronomers sighted an immense cyclonic storm system raging near the Red Planet's north pole. 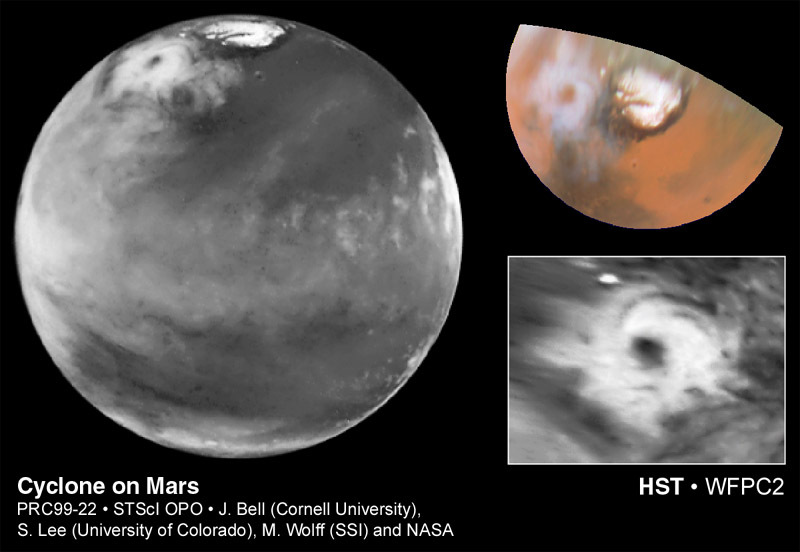 Their discovery picture, made with the Hubble Space Telescope on April 27, is seen at left while the projected insets (right) show closeups of the storm and surrounding areas. Shrunken to its martian midsummer state, Mars' north polar cap appears at the top of the discovery picture. The polar cap is clearly smaller than the storm just below it and farther left. Similar to the "spiral storms" detected on Mars over 20 years ago by the Viking spacecraft, this storm was marked by a system of swirling bright water-ice clouds instead of the billowing dust of a more typical martian wind storm. Measuring roughly 1,000 miles across, with a cloud-free central eye spanning about 200 miles, it was comparable in size to cyclones seen in planet Earth's polar regions. The storm system was imaged once more, hours later, but then was not seen again and may have had a lifetime of only a few days.